I love adding fresh berries to breads, muffins and other desserts, but you don’t always need fresh berries to give something a great berry flavor. Often, jam or preserves will do at least as good a job, as their concentrated berry flavor can add a more intense sweetness to some baked goods than fresh berries alone might do. 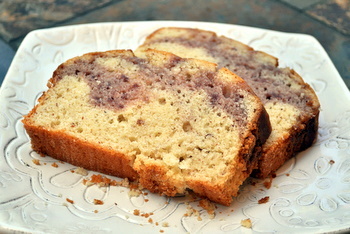 This Raspberry Almond Swirl Bread is a quick bread that takes advantage of this. I added some (whole fruit, all natural) raspberry preserves to part of and almond-laced batter, then swirled it into the plainer batter before baking. The result is that this bread is almost like two breads in one, and the raspberry flavor is really concentrated in that lovely pink swirl. The bread itself is not too sweet and has a mild almond flavor to it. The almond flavor comes both from ground almonds added to the batter and from some almond extract that is added in. While the amount of almond meal is fairly small, it is enough to give this bread a tender and slightly crumbly texture. In contrast with the base almond batter, the raspberry swirl is sweet and has a flavor that really pops. Some quickbreads are very cake-like, but this one has a more muffiny flavor and texture. This makes it great for toasting and it goes very well with a smear of butter or cream cheese. It’s still tasty on its own, of course, and you won’t be missing out if you eat it plain, either! I kept the top of the loaf plain, but a sprinkle of coarse sugar or a small handful of chopped almonds would add a nice finishing touch to this bread, too. In a large bowl, whisk together flour, almond meal, sugar, baking powder and salt. 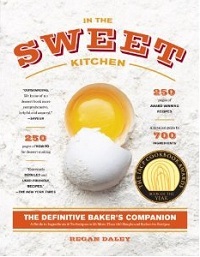 In a medium bowl, whisk together eggs, vegetable oil, buttermilk, and vanilla and almond extracts until well combined. Pour into flour mixture and stir until just combined and no streaks of dry ingredients remain. Place raspberry preserves in a small bowl and stir until smooth. Take 2/3 cup of this batter and add it to the preserves. Stir until well combined. Pour about half of the plain batter into the prepared loaf pan. Pour raspberry batter on top of it. Dollop raspberry batter with remaining plain batter. Take a butter knife and swirl gently through the batter. Bake for 60-65 minutes, or until a toothpick inserted into the center comes out with only moist crumbs attached. Turn loaf out onto a wire rack to cool before slicing. 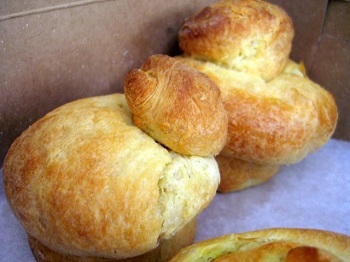 Next PostNext What is brioche? I’ll bet that really is good toasted up for breakfast…yum! it must be so yummy! I have been looking for a recipe to use some preserves I bought a little while ago. This looks perfect! Thank you for sharing. Just pulled some out of the oven. It smells fab! I may try it with other preserves as well. I think it would be yummy with peach. I made it with sour cherry preserves and used more almond extract than vanilla (same amounts, just switched). Very thick batter was hard to work with and it makes a very heavy loaf, but _very_ tasty and moist – hard to believe it only has 6 Tbsp of oil! I use a convection oven which usually takes less time; took it out at 55 min and the top bit of the loaf center was still not quite done; I was afraid to leave it in any longer though. Will make again and try baking 5 min longer. Yum! I made thies yesterday because this is my absolute favorite flavor combination & I think it overbaked/dried out a little. I used half whole wheat flour and half white, and the minimal oil could have contributed, but at least I know I’m eating something healthier! I was super excited to eat this. Thanks for the recipe. Found it very pretty, but very dry. Maybe a difference in altitude?